To sentence a man to die in prison for something that the federal government gave him permission to do and for something others in his position routinely do is plainly a huge miscarriage of justice. In a Florida prison a retired FBI agent named John Connolly is looking forward to dying behind the walls. Like one of the persons who landed him there, James “Whitey” Bulger, he will leave prison being carried on a stretcher outside to a hearse. Those involved in John Connolly’s case do not see him. They sadly have no understanding of his situation. They are too busy to consider his plight. They just accept that he was a corrupt FBI agent. Connolly’s voice is drowned out by FBI agents, even those who support him, who cling to the idea that the FBI is always right while looking in the face of its wrongful actions. They are unable to face the truth. His voice is drowned out by loud voices in the Boston media continually labelling him as a “corrupt agent” without disclosing their animus toward him. One especially is Howie Carr, a Boston Herald columnist and radio host who carried on a brutal attack on him for his personal financial gain. I fund it ironic that many John Connolly supporters relish Carr’s attacks on others without recognizing those other victims of his poison pen may like Connolly, or Probation Commissioner O’Brien, are being wrongfully attacked. I don’t consider myself a supporter of John Connolly nor am I related to him in anyway. I know him only because I’ve had a few conversations with him when I was a Deputy DA and he an FBI agent. My main reason for not being a fan of his is that he entered into a compact with two evil men to protect them (keep them safe). In doing this he knowingly hurt others by allowing these villains to prey on them or by working against those who appeared to be a threat to them..
John Connolly job in the FBI was to operate persons designated as TEIs. It was said he had at least ten of them. The TEI program was started before he became an FBI agent in the early 1960s by J. Edgar Hoover. The program still exists. That it does will forever be a blemish on the FBI’s reputation. The idea behind it is for an agent to find high level criminals with access to information on other high level criminals and to develop a long-term relationship with them so that they will provide information to the FBI against the others. To do that it is important that they be protected and kept on the street. In other words the FBI has a program that favors some vicious criminals over the others. It is designed is to ensure its favored vicious criminals remain free to commit crimes while providing information to it. I find the idea that criminals are protected so that they can victimize people a perversion of justice. I am unable to understand by what right the FBI across the nation protects major criminals and their enterprises while they victimized other people. 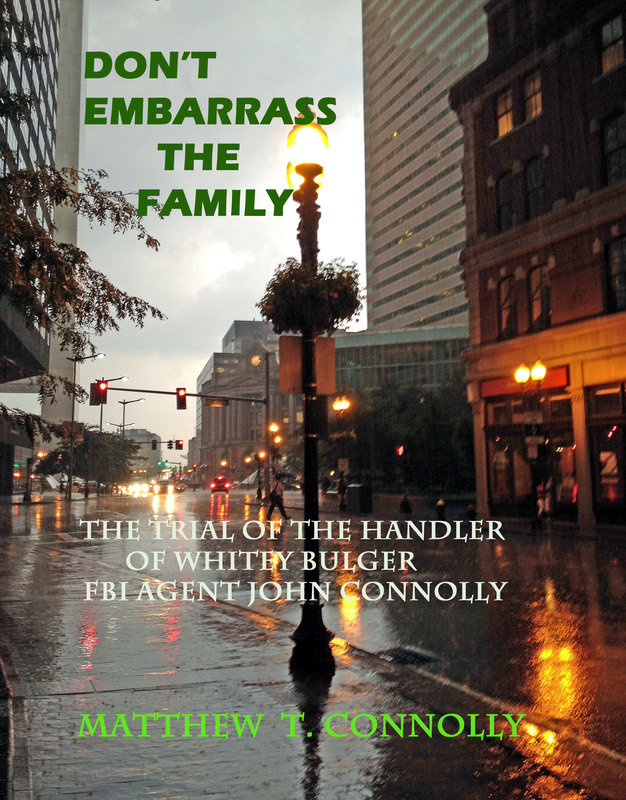 While John Connolly’s informants were murdering innocent people and fellow criminals who they thought presented a threat to them Connolly and his fellow FBI agents were doing their best to keep them safe so they could continue their murderous ways. c’mon Jerome you can do better than that, eh? Shortly after his appointment as Special Counsel to investigate Russia’s alleged interference into the 2016 presidential election, a former colleague characterized Robert Mueller as “ramrod straight” and “utterly incorruptible.” Similar language was breathlessly repeated in mainstream media outlets such as Politico, BBC, and Time magazine. Mueller’s Vietnam-era service in the United States Marine Corps and 2004 tag-team with then-Deputy Attorney General James Comey to (supposedly) save American democracy from warrantless spying are mainstays of these biographies, sending a clear message that his integrity is not to be questioned, that his dedication to evenhanded justice is beyond reproach. It’s always suspicious when anyone’s credibility is pushed hard like this, but that goes double when the same person was FBI director for 12 years—spanning across both the Bush and Obama administrations from 2001 to 2013—yet most people can’t remember anything about him. We should remember things such as actions he took to impartially uphold the law. Sadly, that is not the case. What stands out most during then-FBI Director Mueller’s term in office is the two-tiered system of justice, when obvious crimes and scandals involving government officials and private-sector elites were ignored or even covered up by the FBI. Much of the worst behavior of government officials in the Bush and Obama administrations was given a pass by Mueller’s FBI, as well as a megabank that laundered billions of dollars for Mexican drug cartels and sponsors of terror. Simply put: Mueller helped to create the swamp that needs to be drained. He’s a dirty cop with no business being anywhere near any national security investigation, but especially one involving James Comey. Although nowhere near as famous as the other examples, the HSBC money laundering case reveals the complete and total corruption of federal law enforcement toward the end of Mueller’s term as FBI Director. Mexican Drug Cartels: From 2002 to at least 2009 (and possibly much longer), HSBC bank laundered billions of US dollars for El Chapo’s murderous Sinaloa Cartel and similar groups. In 2009, Forbes placed El Chapo at #41 on its “World’s Most Powerful People” list. The same year, many experts agreed that Mexico’s drug war had rendered it a “failed state.” By 2012, the Sinaloa cartel alone was estimated to have annual revenues of $3 billion, which were comparable to Facebook or Netflix. By April 2013, toward the end of Mueller’s term, the Sinaloa and other Mexican cartels had become the number one importer and distributor of narcotics inside the United States (with many of their top agents living inside the United States), El Chapo had become “public enemy no. 1,” and 70,000 murders and nearly 27,000 disappearances were attributable to the drug war inside Mexico. Ignoring the obvious, HSBC inexplicably designated Mexico a “low risk” country for money laundering, allowing shady depositors and known drug kingpins to deposit billions of US dollars—in cash—into bank accounts in HSBC Mexico, followed by the same money becoming accessible at HSBC in the US. With legitimate-looking banking, the Mexican drug cartels were given huge expansion potential inside the US that would otherwise have been easily detected if they had tried to purchase properties, vehicles, and shell businesses here using large pallets of cash. Much of the cash crossing the US-Mexico border (estimated at $25 billion per year in 2010) found a ready home in HSBC branches south of the Rio Grande. HSBC Mexico made billions of dollars in suspicious transactions, such as customers depositing hundreds of thousands of US dollars into a single bank account in a single day, during which the cash was put through teller windows in boxes that were designed to fit through the window openings. Because there was virtually no investigation into these transactions or even the identities of depositors, who included high-profile drug dealers, accounts were rarely closed due to the suspicious activity. After all, Mexico was a “low risk” country for money laundering at the time. Terrorists and Rogue Nations: The bank’s practices also allowed terrorist groups and rogue nations to have access to our financial markets in a similar manner, facilitating financing of their activities inside this country, as well as providing greater international investment possibilities for sanctioned regimes—including $19 billion deposited from Iran into HSBC’s foreign affiliate banks. There were also lax rules for setting up relationships with affiliate banks in other countries, which included at least one Saudi Arabian bank with ties to funding terrorism. Policies Prevented Catching Crooks: Even in the rare instance where money laundering controls were in place, inadequate follow-up measures undermined any intervention. The US division of HSBC allowed thousands of suspicious accounts to remain open after they were flagged for closure. “Know your customer” practices were virtually nonexistent, which allowed bad actors to get around things like Iranian sanctions and Patriot Act protections, which in turn was aggravated by bank employees doing things like deleting information about the country of origin on deposits from places like Iran. Large-scale warnings, such as the migration of billions of US dollars in cash deposits into HSBC Mexico, went unnoticed because the bank apparently had no system in place to monitor such activity. To say all of this was “extremely reckless” would be an understatement—it’s inconceivable that the bank’s employees and executives didn’t know. “Ramrod” Mueller to the Rescue: What did Mueller do to aggressively investigate and shut down this massive “foreign influence” involving our country’s drug epidemic and possibly even terrorism? Basically nothing. No bank executives or employees were arrested or jailed. People have spent more time in jail for smoking a joint than any HSBC executive or employee did for facilitating drug cartel business and terrorist financing. On October 17, 2010, the Treasury Department issued “cease and desist” letter to HSBC for violations of the Bank Secrecy Act. This was followed by a one-year Senate subcommittee investigation, which provided a comprehensive report and took hearing testimony on July 17, 2012. In what appeared to be prepared remarks, one bank compliance executive resigned at the hearing and another executive indicated HSBC “did our best” in Mexico. With all of the investigation already completed and in the public eye as a result of the Senate investigation, the Department of Justice was finally forced to file a four-count felony indictment against defendant HSBC on December 11, 2012, which included three felony counts relating to insufficient anti-money laundering practices and one count for violation of the Trading With The Enemy Act. On the same day, and over the objections of career DOJ prosecutors, then-AG Holder allowed HSBC to enter into a deferred prosecution agreement, under which the charges would be dropped if the bank stayed out of trouble for 5 years and paid a “record fine” consisting of $1.256 billion in forfeited assets and an additional $665 million in civil penalties. Added together, the punishment totaled approximately 9% of one year’s profits for HSBC’s worldwide operations, which amounted to a whopping $21.9 billion in 2011 alone. But not everyone bought into Lynch’s sales pitch. Even CBS News seemed suspicious of the deal, which was obviously disproportionate to the criminal conduct involved (VIDEO). While a US citizen sending money to terrorists can result in a 20-year prison sentence, and many US citizens have been sentenced to decades n prison for even marijuana-related crimes, the bank’s executives and employees never spent one day in jail for their roles in assisting terrorist-connected nations and Mexican drug cartels to do business—an example of the “two systems” of justice than many Americans believe exist between the elites and regular citizens. On a side note, when is Francis Salemme trial? It seems to me that Salemme must have pissed off Whyshak in some shape or form. Wasnt Salemme granted immunity years ago so wouldnt he have fessed up to the DiSarro murder back then? The basic answer was the Boston media frenzy pushed by the Globe and Howie Carr in the Herald who hoped that by destroying Connolly they could get him to role on Billy Bulger who was the ultimate target. Remember when Wyshak was asked where John Connolly went wrong he said: “he got to close to South Boston and the Bulgers.” Note the plural. Now why was Wyshak indicating that Whiteys brother brought about John Connolly’s demise? No one politically in Boston would touch it because the Globe and Herald had already made the atmosphere around Connolly poison. It infected the public and the judges. It became accepted that Connolly was a corrupt agent because it was repeated so often. There’s also the tendency of those pro bono lawyers interested in helping people not to be interested in a “corrupt FBI agent”preferring to help those who are more down and under. Connolly does not elicit much sympathy because on one bothers to look closely beyond the idea he was in cahoots with Whitey and Flemmi. They don’t want to know why. Wyshak was in a jam. He was never that fond of Flemmis as he was of Martorano and his new friend Flemmi (rememeber them laughing about Halloran being called balloon head). He had to go after Salemme because Flemmi had put him at the murder. As for the trial date, I haven’t checked on it but it may be one of those cases that lingers forever. Salemme wa s not granted immunity. He made a deal to get a sentence reduction if he testified against Connolly. Part of the deal was he did not have to testify against any Mafia guys. At Connolly’s trial he denied being involved in the murder of DiSarro. The FBI decided after it was embarrassed by the NY State police breaking up the Mafia conference in Appalachin which showed a nationwide group of Mafia guys and J. Edgar Hoover having said there was no such group to go after the Mafia. It made as it priority wiping out the Mafia. Anyway it could do it, planting bugs by breaking into places or joining up with other criminals was fine as long as the goal was reached. (It had previously done something similar destroying the Communist Party and would do it against “subversives” in the lat Sixties.) The outcome was all that mattered. Should the FBI be shut down? to move us to shut it down? our lives than the amount of order it brings”? FBI agents have given us. You really need to explain why the FBI needed the Mafia. role FBI agents play in maintaining the Deep State. Please tell us your wildest hopes for running this blog. Please tell us your worst fears in running this blog. I think people have formed a thought process on John Connally because of all the books, media coverage and trials during the past roughly thirty years. You know much more about the day to day workings so to speak of what went on many years ago. It looks like the FBI needed a scapegoat during the many years Whitey was on the run.I just saw our President on video talking about fire and fury, perhaps the John Connally saga is not uppermost in peoples minds during these troubled times. Who relishes Carr’s attacks? Most recognize him as a smear artist and character assassin. Nixon, Trump, Gov. King and Sen. Bulger were all subjected to relentless villification by the media. They were all victims of Fake News One has to realize that Carr has no insight about gangsters in Boston. He grew up in Florida and doesn’t arrive here until he is thirty years old. He only knows what Martorano told him. He has no capacity to distinguish fact from fiction. Did he know Spike O’Toole, Connors, Bucky Barrett, Manville, Kelly or the O’Sullivan family? No never met them. Yet he passes himself off as an expert. If one asked a person who grew up in Dorchester whether T and Spring or the Flynn brothers were into crime. They could answer based on experience. Carr couldn’t. He has no first hand knowledge of anything. Just repeating self serving stories by hitmen. 2. The Norfolk DA didn’t know Amy Bishop was a murderer and they didn’t let her prey on the people of Alabama where she murdered three. The State cops and the DA are not responsible for Myles Connor’s crimes even if he was at one time an informant. If the Police use an informant in a drug case and that informant sells hard drugs that result in an overdose death they aren’t culpable. No law enforcement agency, State, local or Federal had proof of any killings by Whitey and Flemmi until 1999. 3. All the State cops save Lowell walked away from Naimovich when he was falsely accused. How are they different from the FBI? $. Using the TEI program the Feds put the top fifty Mafia guys in NY and New England behind bars. How did the State, Quincy and Boston Police do? Did Schneiderham prevent all their investigations? 4. Flemmi first testified under oath in 1998 that Connolly was honest. Whitey’s first statement was Connolly got no money. Connolly testified under oath that he never got a nickel from the gangsters. Those first responses are likely true. Only after talking to lawyers and crafting self serving statements does Connolly become corrupt. 5. You aren’t really making the claim that the FBI knew the gangsters were committing murders and they permitted that are you? That is a false claim that Howie Carr would make. I’m saying what John Connolly said. He said the FBI put him in the position to deal with people who were known murderers. Those are his words. I’m sure the FBI did the same with other agents. You may recall that Vinny (the Bear aka Jimmy) Flemmi who wanted to be known as the biggest hit man in New England was put into the TEI program even though the FBI knew he was a murderer and wanted to claim that title. Rossetti was suspected of murders as was Whitey and Flemmi. Did you ever hear of Greg Scarpa and FBI agent Del Vecchio? They made a nice pair. You also say “Using the TEI program the Feds put the top fifty Mafia guys in NY and New England behind bars.” That’s all true. It used the program and a lot of TEIs being protected by the FBI were murdering other people. Had they not been protecting TEIs and gone after them a lot of people might be alive today. We can never know that but there is a chance the FBI could have decimated the Mafia without using TEIs. As it turned out a lot of “stand up” Mafia guys folded pretty easily when faced with long terms. I learned the end does not justify the means. The means used by the FBI to protect top level criminals who to keep their position in the criminal world have to continue to commit crimes is an improper means for a law enforcement agency to use. As for Naimovich he was abandoned as you suggest after the feds indicted him by most of the state cops. Steve Lowell stood by him as did others. I reviewed the testimony of Charlie Henderson and Bob Haley and they stood by him defying feds attempt to make them do otherwise. Connolly was indicted by the feds for doing what he was supposed to do. Some of the FBI agents stood by him by testifying for him. The more I think of it the more their cases seem similar. Naimovich dealt with an informant who came in and lied about his interactions with him being pressured by O’Sullivan to do so. Naimovich’s job was to deal with informants. Connolly too was undermined by a lying informant. Some big differences though. I’ll have to think more about it especially considering Connolly was on the team that went after Naimovich. Was that protecting his informants? True indeed . NC is not naive . If he believes otherwise it is disappointed idealism . As to Carr , he is a complicated deal . He can be a first rate SOB . The facts are though that he knows the truth about several matters that involve our beloved Agents that bloggers , in particular Judge Tinney , would be aghast to find blow her categorical statements of fact to Kingdom came and went . Carr is responsible for his own ethical judgements . These of course are legendary for a variety of reasons . He is not a fool . He has parlayed his cards into a consiglierie’s chair with Trump . He is connected . Bigtime . Let’s avoid long sentences is a writing style I can relate to . Jimmy hates him on principle . But under different circumstances he would have respected that the doughty Portlander has a lot of sand . Take my word for it . All of youse!